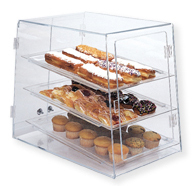 This table top pastry display case has three shelves and one hinged door on the customer side of the case. Two hinged doors on the back allow you to stock your pastries with ease as your customers help themselves. The acrylic trays are removable and are included. This Table Top Pastry Display offers a efficient way to show your merchandise. Constructed of clear Acrylic, this Countertop Pastry Display, Food Display is a surprisingly simple way to serve your customers. Buy Table Top Pastry Display now - Use our convenient shopping cart or give us a call and place your order with a knowledgeable service representative today!